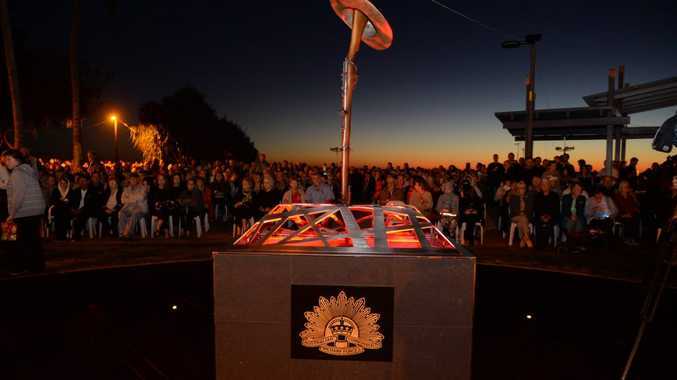 RECORD crowds of up to 10,000 people lined the esplanade at Bargara as the sun rose over the ocean during the Bargara Anzac Day Dawn Service. Bargara Commemoration Committee chair Greg Barnes was overwhelmed with the turnout as young and old paid their respects to those who made the ultimate sacrifice for their country. Men, women, children, dignitaries, and relatives of servicemen and women who fought for Australia and New Zealand stood side by side to mark the 100 year landing of Gallipoli. Cr Barnes led the service which included the fly past by a P51D Mustang and the firing of three rounds of a 1901 Naval Fieldpiece. "We remember that the men and women that defend this nation have instilled in them the absolute commitment and resolve to reject fanaticism, spurn the cowardice of terrorism, to oppose inhumanity and to fight for the inherent right to freedom for all people whether they be the fortunate or the oppressed," he said. "I think it's important that we also note particularly the children and as we do so we acknowledge those who are young today have never marched to concur what lay before them, they have marched to defend what lay behind them." Member for Hinkler Keith Pitt also addressed those in attendance and remembered the courage, service and sacrifice made by all war and peacekeeping operations, particularly Gallipoli. "We remember Gallipoli, the disastrous campaign but a campaign that displayed our nation's courage for the world to see," he said. "When you consider that so many of our veterans, when they went to war were not much older than the children that are here today, I struggle to adequately express my gratitude to those who have served our country." Mr Pitt asked the children in attendance at the service to remember today so that the links to the past are never forgotten. "Remember the last post and our nation's flag flying at half mast," he said. "And remember those who died, those who have served and those still in the service of those nation." "It is there sacrifice, commitment, selflessness, loyalty that allows us to live as Australian, a free, a proud and democratic nation." Cr Barnes said the number of people at the service was far above and beyond anything they could have hope or imagined. "We knew it was going to be big and we never in our wildest dreams thought it was going to be this big," he said. A faultless, moving tribute's only minor disruption was the start was delayed to allow cars backed up to the turtle roundabout time to make it to the service.